The world’s largest peer-to-business lending platform has conducted a stress testing of its loan book. Following on from the comparable efforts of Landbay roughly a week before hand, Funding Circle recently published the results of an independent investigation into what effect a downturn in UK economic conditions might have upon investor returns. The move came shortly after the Bank of England published the results of a stress testing of the UK banking system – Funding Circle being of the belief that peer-to-peer lenders ought to undergo a similar level of scrutiny. The scenario trialed by the platform thus mirrored the example laid out by the Prudential Regulation Authority (PRA) for the 2014 banking stress test. Funding Circle describes this scenario as the “most stringent” on offer. Without delving too deeply into the procedure (details of which may be freely perused via the Funding Circle blog), the platform invited external consultancy firm Hymans Robertson to undertake the task. In brief, 10 industry specific models were built, following the same methodology that banks employ, in order to stress test the Funding Circle loan book. The results? In the above-mentioned PRA scenario, UK GDP drops by 4% on a cumulative basis (for context UK GDP dropped 7% in the 2008/2009 downturn), interest rates climb from 0.5% to 4.2%, and inflation jumps from 1.8% to 6.6%. The bottom line, results wise, is that even in the most extreme economic conditions the average annualised returns for Funding Circle investors remained upward of 5.5%. The stress test indicated that the platform could expect, naturally, to see a hike in annualised bad debt rates – from 2.2% to 3.4% at peak on a yearly basis. Over the 3 year stressed period, the Hymans Robertson analysis suggested that bad debt would be at 2.5% at year 1, peak at 3.4% after year 2, and begin to fall again in year 3. This all seems pretty rosy, considering the severity of the theoretical economic conditions. Are there limitations to the exercise? Of course. The Funding Circle blog post readily admits that the stress test is an estimate, and that past performance must never be relied upon as indicative of future performance. The analysis appears to be very comprehensive and it is carried out by a reputable firm of independent experts. But does it pass the sniff test? Is the PRA stress test harsh enough? Certainly the fall in GDP modeled is not as large as the 7% fall seen in the 2008/2009 downturn (although it is bigger than the 3% fall seen in the early 1990s). The resultant rise in annual default rate from 2.2% to a peak of 3.4% (or a 0.5x increase) seems like a relatively small move when one considers some other relevant data points. Looking at the increase in default rate for Zopa, the only UK P2P lender in existence during the 2008 downturn, it can be seen that 2008 loans exhibited a 10 fold jump in default rate relative to 2007 loans whilst there was only a moderate increase in the riskiness that Zopa perceived (as shown by expected default rate). Adjusting for this increase in risk, the default rate appears to have jumped by almost 7x. This is much larger than the 0.5x increase in the analysis that Funding Circle has published. The experience of the two major US platforms (Lending Club and Prosper) in the 2008 and 2009 periods was also that defaults spiked significantly more than the 50% figure from the Funding Circle stress tests. 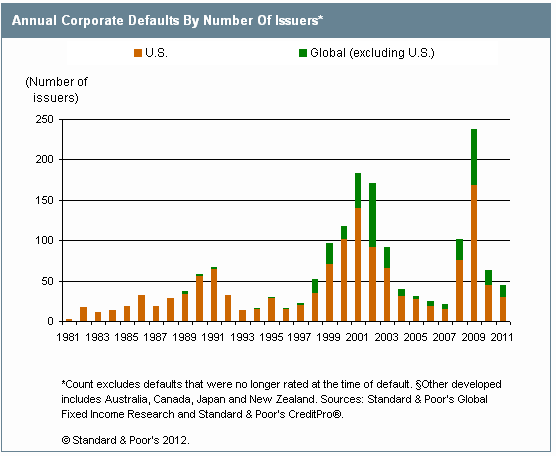 Examining corporate default data published by S&P shown below, taken from S&P’s website, it is evident that the magnitude of the increase in defaults from low to high is large. 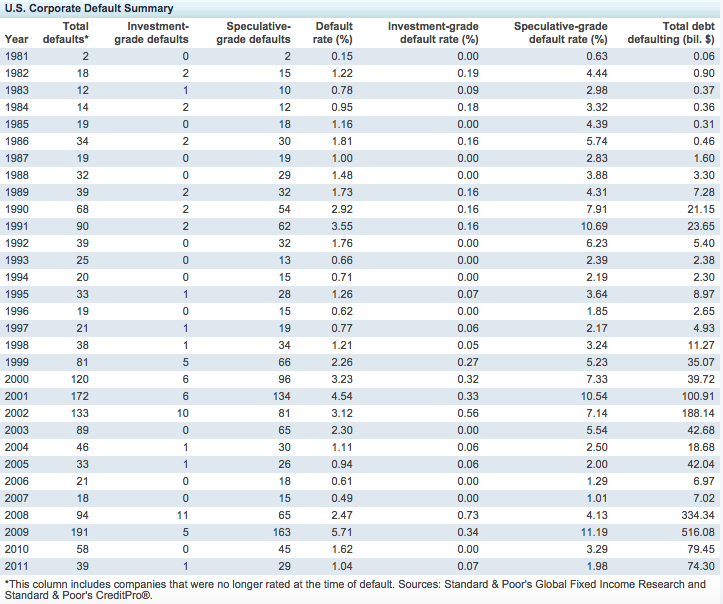 In the late 1990s/early 2000s downturn, defaults increased by a factor of around 4x from average trough to peak. In the 2008/2009 downturn a 6x average trough to peak movement was observed. Both of these are much higher than the 0.5x at which the Funding Circle stress test arrives.